Russian, twenty years old, powerful and determined - unrelenting and the winner. 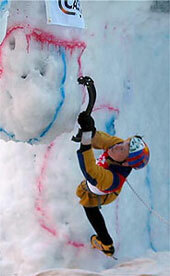 Welcome to Alexei Tomilov, the victor of the Ice Master World Cup in Valle di Daone. As was to be expected, today's Final proved to be extreme (no male athlete topped out) and, after three straight days competing, the young Russian was justifiably rewarded for his regularity throughout the event. Harry Berger, favourite for first place, fought hard but was beaten by a Tomilov who produced an outstanding result on the first problem, failing just beneath the top. Tomilov continued to climb well on the second problem, where Berger had difficulties - but the latter proved he was still a force to be reckoned with on the third and final route, where he was the only competitor to make any headway into the final drytooling section. Berger's second problem mistake was shared by almost all others, including the reigning World Champion Krivosheytsev and Stephane Husson, who hurt his back and was forced to retreat from the competition. The horizontal 3m roof stopped all and only Tomilov and the young Swiss revelation, Samuel Anthamatten managed to climb over half-way. And although the top of the third boulder proved elusive, it was nevertheless a fitting final: Kurt Astner climbed switfly up the overhanging column, as did Krivosheytsev, Tomilov and Anthamatten. The latter three all burnt out on the hanging drip, and only Berger used the undercling to plant his axes into the wooden pannel. As the crowd erupted the time ran out... but this didn't seem to matter, the hundreds gathered here today enjoyed the show. Evgeny Krivosheytsev placed fourth, Markus Bendler fifth, Aliaz Anderle sixth and Kurt Astner seventh. Ines Papert ruled in Valle di Daone today. The German climbed securely throughout, demonstrating great power and technique on all three routes. 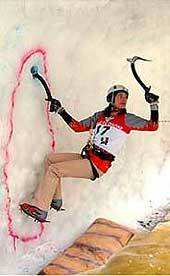 The competition got off to a difficult start though, with a horizontal roof with hanging drip; great power and refined dry tooling were the key to success and all except for Papert failed here, although Natalia Koulikova climbed to within a hair's breadth from the top. The second problem through an overhanging dry tooling section proved to too much even for the World Champion, like all the others tired after three days of continnuous climbing. Papert, Buchmann, Watkins, Koulikova, Sdobnikova all reached the same zone, while Go Misung, Muller and Shabalina fell lower down. The third and final problem proved to be decisive; up the long column and out into the open, overhanging all the way to the highest top on the structure, reached in the dying seconds of the competition by Ines Papert. The crowd erupted with joy, and celebrated together with last year's winner here in Daone, Ksenia Sdobnikova, second. Abby Watkins and Kirsten Buchmann placed fourth and fifth respectively, but could easily have placed higher. Muller, Shabalina and Go Misung completed the final ranking. And so the competion draws to a close, superbly, just as was to be expected from the Valle di Daone. As was often heard by the athletes, this small valley is without a doubt an important reference point for ice competitions worldwide. Thanks goes to all those who made it happen, from Maurizio Gallo, the ice structure architect, to Riccardo Milani, the route setters, ice makers, organising comittee and the entire valley. Congratulations and see you... in 2004!